An engraving of the Martin spouses on the day of their marriage, surrounded by a wreath of roses which symbolizes holiness, love, and fidelity. The biblical couple Sarah and Tobias evokes the eminent role of the vocation of marriage in the history of humanity and in the history of salvation. "Lisieux, October 19, 2008" recalls the place and the day where the Holy Father, Benedict XVI, inscribed the two spouses jointly in the Book of the Blessed. The wreath of roses and the figures of Sarah and Tobias are taken from the medallion that Louis Martin selected as a souvenir of the night of his wedding to Zélie Guérin, July 13, 1858, at Our Lady's Church in Alencon. The medal was blessed at the moment of their exchange of vows. The original medallion, still in existence, is at the bishopric of the diocese of Sées, in which Zelie was born. To see photographs of it, please click here. A bronze medallion, silver-toned, with an antique patina, designed by the creator of the reliquary of Blessed Louis and Zélie Martin. Dimension: 60 millimeters in diameter; 14 millimeters thick. (About the size of a coaster. For display, not to be worn). You may download flyers about the medallions from this Web page. Please feel free to reproduce them to make the medallions available to those who are not online. 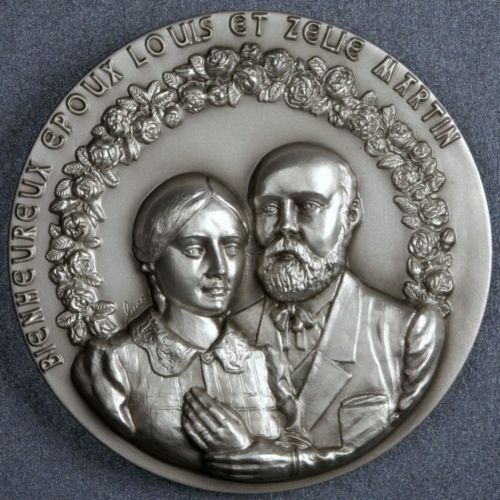 Below is a description of the original marriage medallion Louis gave to Zelie. You could copy this as the reverse side of the order form above.